There are so many good places to eat in the Loop that sometimes it's hard to pick just one. Neighborfood has got you covered. 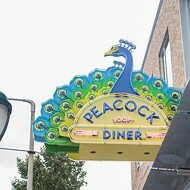 On Saturday, July 27, the dishcrawl will tour the Delmar Loop in University City and hit eight restaurants. The first Neighborfood tour went down Washington Avenue (we had a great time). This time, everyone will meet Saturday afternoon at 2 p.m. at Three Kings Public House (6307 Delmar Boulevard, University City; 314-721-3355) to check in. You can also buy admission tickets there and additional food and drink tickets. Admission is $10 if you buy ahead of time (tickets are available here -- there are 84 left!) or $15 the day of. It includes one food/drink ticket, which gets you a dish or a beverage at any of the restaurants and a raffle entry. Neighborfood also benefits several local nonprofits, and you can choose which one you'd like to support: Animal House, Gateway Greening, Habitat for Humanity St. Louis, Missouri Coalition for the Environment, Prison Performing Arts, The Green Center and Urban Harvest. 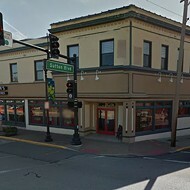 Neighborfood will take hungry patrons to Three Kings, Blueberry Hill (6504 Delmar Boulevard, University City; 314-727-4444), Fitz's Bottling Company (6605 Delmar Boulevard, University City; 314-726-9555), Mission Taco Joint (6235 Delmar Boulevard; 314-932-5430), Nico (6525 Delmar Boulevard, University City; 314-727-0200), Pi Pizzeria (6144 Delmar Boulevard; 314-727-6633), Ranoush (6501 Delmar Boulevard, University City; 314-726-6874) and Seoul Taco (571 Melville Avenue, University City; 314-863-1148). 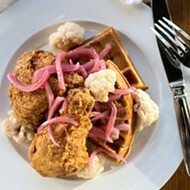 The next Neighborfood crawl will explore Clayton on August 13. Get tickets and more info here. Gut Check is always hungry for tips and feedback. Email the author at nancy.stiles@riverfronttimes.com or follow her on Twitter.